An On The Fly question can be introduced into any Keypad, Nearest Wins, or Buzzin’ question. You can either do a complete round of On The Fly questions or you can insert an occasional On The Fly question into a round where you have loaded a Quizpack by using the Insert Question feature. In the Let’s Play screen click the On The Fly button on the keypad section to start an On The Fly Keypad round. You need to have a question prepared in your head (or written down). Decide whether it is Letters, Multiple Choice or Numbers format. Let’s say you’ve clicked Letters. You now ask the question. “Name the drummer from the White Stripes?” Now start the End Round timer as per usual. Then at the end of the 10 seconds you are presented with a virtual keypad on the host screen..
You now input “M” for Meg White The results then appear on the screen the same way they would when using a Quizpack. EG. 4 teams answered correctly, the correct answer is “M” This method work’s the same for Numbers, Multiple choice and Nearest Wins questions. 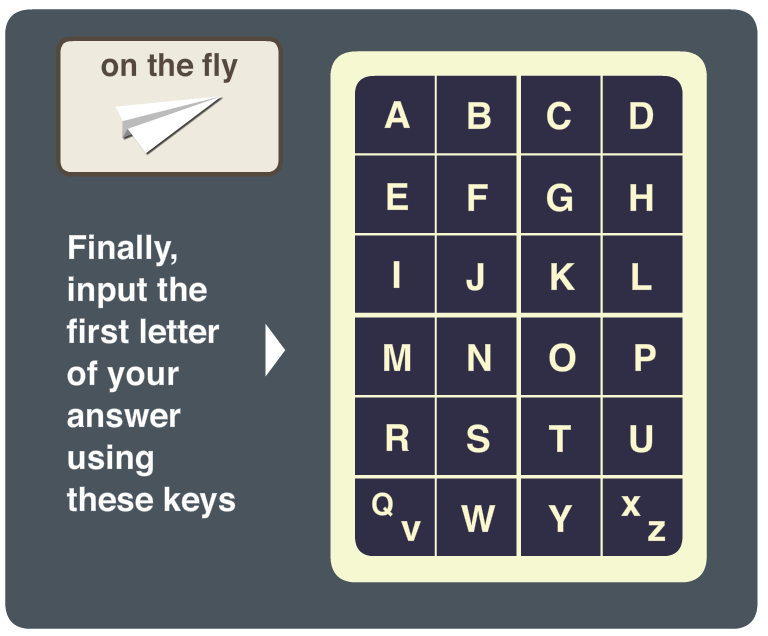 On Buzzin’ questions On The Fly is even simpler since you don’t even need to input a letter. To insert an On The Fly question into a loaded quizpack round rather than an On The Fly round simply hit the button marked… .. during a round.